According to a new report by the International Renewable Energy Agency (IRENA), the sweeping changes affecting the energy industry could leave more than US$10 trillion in coal, oil, gas, and related assets stranded. IRENA made these reports in preparation for a G20 meeting on climate and energy, but the news underscores a growing number of reports indicating that the fossil fuel industry is on precarious economic ground—posing new risks for companies that rely on oil, gas, and coal. Dozens of leading companies from a wide range of industries—including Apple, GM, Goldman Sachs, Pearson, P&G, Walmart, Wells Fargo, and many more—have joined the RE100 commitment to go 100 percent renewable. As companies consider where to invest in power for their operations and supply chains, they should carefully weigh three main business risks that are pushing many companies away from fossil fuels and pulling them toward the promising opportunities presented by clean energy. A 2016 report by the Financial Times energy editor Ed Crooks painted a stark picture of the U.S. oil industry. Since oil prices began to decline in 2014, oil industry equipment was being sold off at auctions for bargain-basement prices. The founder of one auction agency said he felt like a funeral director telling sellers about the low-priced sales. “I’m the one that has to tell them the bad news,” he said. The industry’s future outlook is similarly bleak: Over the next 25 years, oil company revenues could fall by at least US$22 trillion, which is equal to twice the GDP of China. Even as revenues fall, the oil industry’s debt is rising. Between 2006 and 2014, the industry’s debts grew from about US$1.1 trillion to US$3 trillion. Between 2015 and early 2016, 52 of the smaller U.S. oil and gas production companies that were participating in the shale gas boom had entered bankruptcy. Given the combination of growing debts and declining revenues, 40 percent of U.S. oil and production field service companies have earned B- or below ratings by Standard & Poor’s. 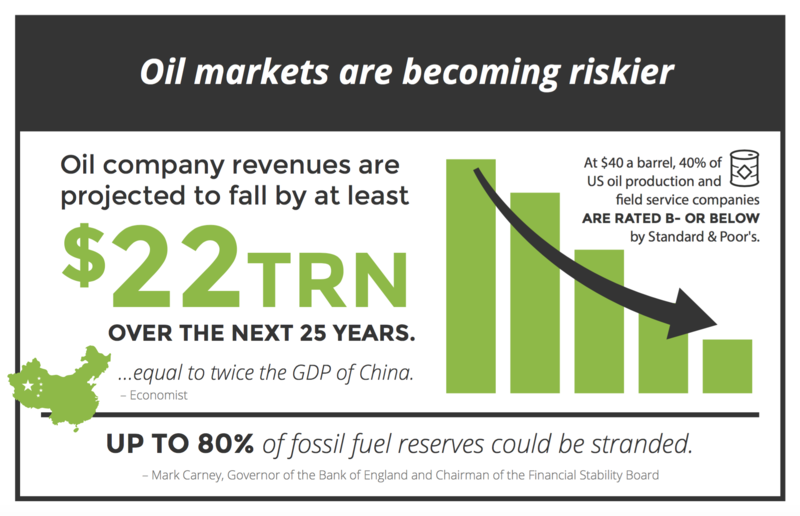 In 2015, Bank of England Governor Mark Carney predicted that up to 80 percent of fossil fuel reserves could be stranded. This substantiates IRENA’s aforementioned prediction that US$10 trillion in assets will be stranded, which is significantly higher than the US$320 forecast by the International Energy Agency. Since the coal mining boom in the 1970s, the U.S. industry has been shrinking, with nearly 200,000 jobs lost since 1979, according to the U.S. Bureau of Labor Statistics. 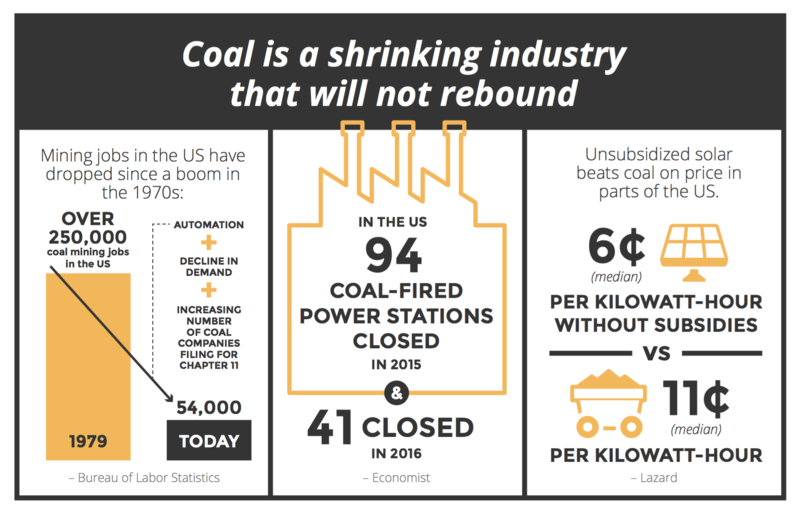 While some political leaders have been pushing a theory that these jobs are lost because of climate-related regulation, economists believe the demand for coal has been shrinking for years. Changes in technology, such as automation, have also contributed to the decline in jobs. In addition to the drop in jobs, more coal-fired plants are closing. In 2015, 94 plants in the United States closed, and another 41 closed in 2016. For the existing plants, the majority of Americans support regulation. According to new data from the Yale Program on Climate Change Communication, 69 percent of Americans support setting strict carbon-dioxide limits on existing coal-fired power plants, and 75 percent support regulating carbon dioxide as a pollutant more generally. As coal declines, companies are wise to look at renewable energy. In some parts of the United States, unsubsidized solar is about half the price of coal. Clean energy also holds the promise of jobs: IRENA predicts that the jobs created by the growth in renewable energy will more than make up for the jobs lost due to the transition away from fossil fuels. In 2016, solar industry employment in the United States grew by 25 percent (to 260,000 jobs), surpassing U.S. oil and gas extraction jobs (177,000), and U.S. coal mining jobs (50,000). The economic risks taking place in the oil and coal markets come at a time when there is increasing public and investor concern over the fossil fuel industry’s climate risks. Earlier this month, BlackRock, the world’s largest asset manager, announced that it will be putting new pressure on companies to disclose how climate change could affect their business. Shareholders are also holding companies accountable. In 2016, shareholders filed 175 climate-related resolutions, up from 167 in 2016 and 148 in 2015, and resolutions are expected to exceed 200 this year. Investor concern is matched by public concerns about climate change. According to the 2016 Yale survey, 70 percent of Americans believe climate change is happening, and more than half of all American adults are worried about climate change and believe it is already harming people in the United States. A Pew survey revealed that there is strong bipartisan support for expanding solar and wind energy production. These developments all speak to a larger trend: As fossil fuels present an increasing number of economic and business risks, smart companies are investing in renewable energy to power their growth.